Minn Fomm il-Bormliżi is an intergenerational project celebrating Bormla's community through a series of interviews. 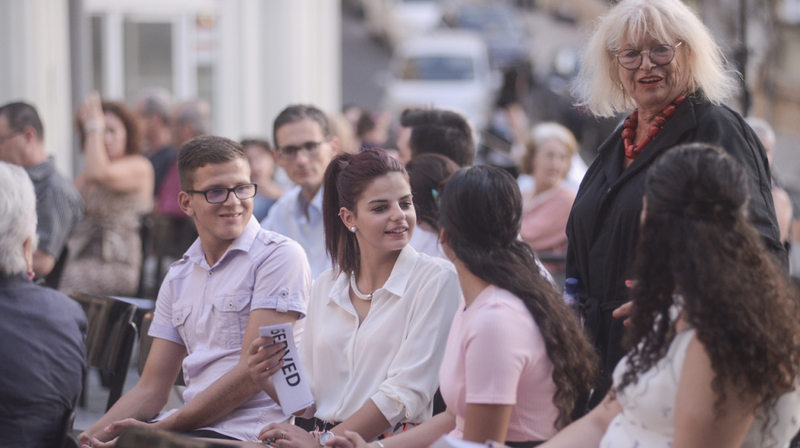 Pictured: Rudi Wester, the Coordinator of Cooperation between Leeuwarden 2018 and Valletta 2018, (standing, back) speaking to the Bormla youths (front). The Valletta 2018 Foundation, together with Forum Komunità Bormliża, marked the project ‘Minn Fomm il-Bormliżi’ – a community-based intergenerational initiative, at Pjazza Paolino Vassallo, Bormla, on Monday 31st August. The project celebrates Bormla’s rich history and community through interviews with Bormla’s elderly conducted by Bormla’s youths. After undergoing a series of workshops, the teenagers learnt a variety of skills such as video recording, video editing and interviewing, which helped them immortalise the testimonies of Bormla seniors who lived in the locality during post-war times. Through the bridging of generations, Valletta 2018 creates an important legacy as a European Capital of Culture (EcoC): that of giving young people the tools to live a life of inclusion and fulfillment by being direct players in culturally enriching activities. Focusing in particular on Valletta and the harbour area, the ECoC includes all the Maltese Islands, with an aim to spread its impact throughout the whole Maltese territory. The ceremony included short addresses from the President of Malta Marie-Louise Coleiro Preca , the Parliamentary Secretary for Local Government Stefan Buontempo, Valletta 2018 Chairman Jason Micallef and Bormla Mayor Alison Zerafa. For their contribution, the teenagers were given a certificate of participation while the senior citizens that were recorded were presented with DVDs containing their interviews.